“The people of the Diocese of Clogher are happy to join you in celebrating and cherishing the gift of life in all its forms and wish every success to your Rally for Life on 2 July in Dublin. I commend the All Ireland Rally for Life Committee on the marvellous work you are doing. Supporting the fundamental right of life for the unborn child is so important and it is good to gather people to celebrate the precious gift of life. I send you my best wishes as you celebrate the Rally for Life, in Dublin on 2 July 2011, and wish the event every success. Many thanks for your letter describing the atmosphere, success and enthusiasm generated by last July’s “Rally for Life” celebration in Belfast. 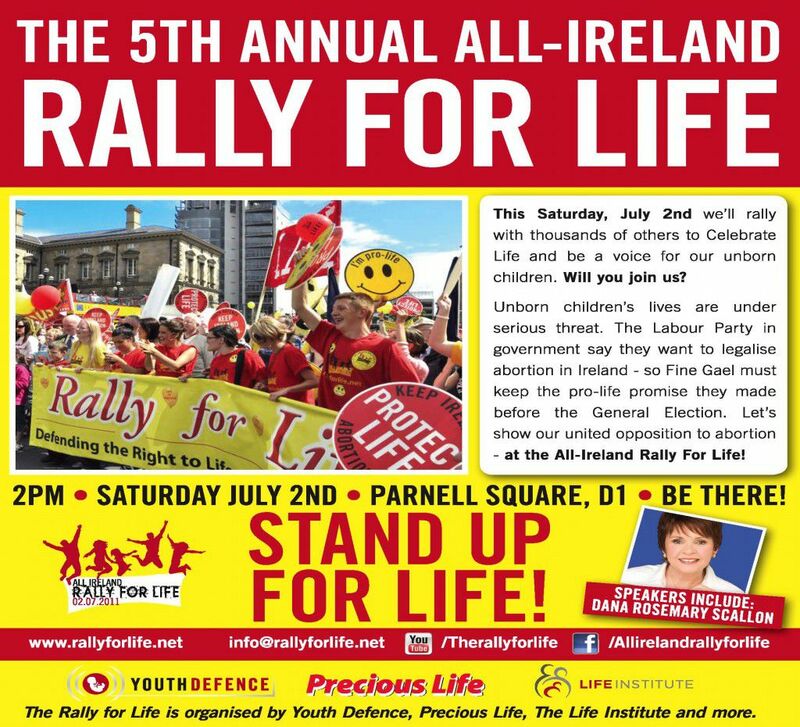 I am confident that this year’s rally in Dublin on 2nd July will be equally successful in highlighting the sanctity of human life from conception to natural death. Thanks you for your letter of 13th of May 2011. In a rapidly changing society one of the values we need to uphold with constant vigilance is respect for life at every stage of its existence. Life is a very precious gift. It deserves reverence, nurturing, protection. I support those values and I support those who share these ideals. May I wish every blessing on your rally in Dublin in 2nd July. I hope that it will, like last year, be a festive occasion, a true celebration of the great gift of life that God has given us.